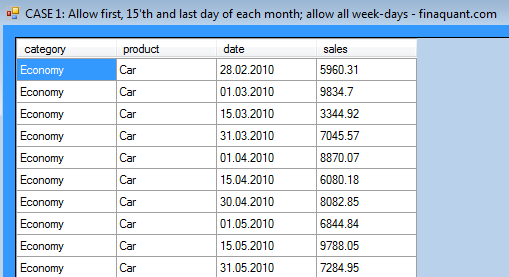 Assume, you have a data table containing daily prices of different products in each entry, and you want to exclude all rows of table associated with weekend days. That is, you want to have only entries with business days from Monday to Friday in your table. Then you need a date filter. Assume, you have a data table containing temperatures measured at different locations almost daily (with some days missing), and you want to have only month-end measurements to calculate the yearly volatility of temperature for each location. If a measurement is missing on the last day of a certain month, the nearest previous temperature should be taken as a proxy value for the month-end day. In such a case, you need a date sampler with search options like previous (backward), next (forward) and nearest as shown below with examples. 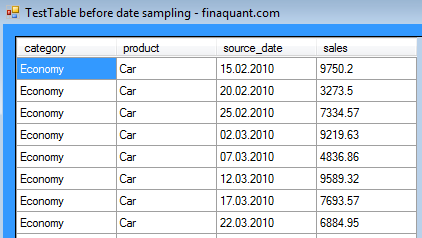 Date-related variations like “last Monday value of each month”, “quarterly month-end averages”, “monthly business-day maximums” and so on can be obtained with date samplers and filters of finaquant® protos1 with the help of the table aggregation functions wherever necessary. Following example shows how rows of a table can be filtered for a date range and for certain month-days within this range. Month-days in the numeric vector AllowMonthDays can be positive or negative up to ±28; -1 means last day of the month. AllowWeekDays =  NumVector.CreateEmptyVector();     // empty vector means "allow all week-days"
Following example shows how month-day and week-day conditions can be applied simultaneously on the input table. Table functions for filtering rows w.r.t. dates are available in finaquant® protos also for other periods like quarter and year. Source dates are the dates that are available in a table. Target dates are the dates that are to be searched after in the table. If a target date is found in the table (i.e. exact match of target and source dates), there is no need to search for a proxy source date. 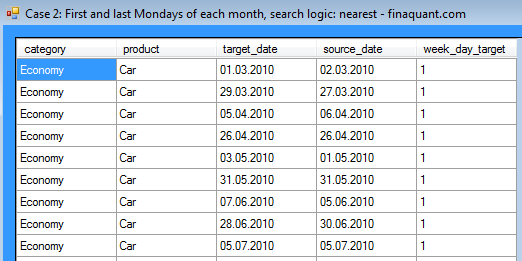 If a target date is not found, a source date needs to be searched for with the given search logic (previous, nearest, next). MaxDistance is another important sampling parameter, which is the maximum allowable distance in days between target and source days. The TestTable shown below will be used for the following examples. Note that the field source_date has values with 5-day intervals between subsequent dates. As seen in the resultant table above, exact matches were found for the target dates 1.4.2010 and 1.5.2010. Proxy source dates had to be searched for other target dates with the search logic previous (backwards in time). Notice that some source dates come before target dates, some after in time, because the search logic is this time nearest. One more and the last example below. For fun, let’s make it slightly more complicated than the others. “All source dates must be business days” means, weekend days must be excluded from the table before sampling for target days. Following code also demonstrates how a simple date range pre-filtering could be applied on the table before sampling in order to improve sampling performance. // Prefilter table for the required date range for improved performance. // is really large compared to the required range to be sampled. Notice that there is not a single source date in the resultant table above as a weekend day. This entry was posted in Calculation engine and tagged calculation engine, date filter, date sampler, table functions. Bookmark the permalink.